With water levels at Lake Mead approaching historically low levels, any amount of wasted water is a bitter pill to swallow. That's why residents of one Mountain's Edge community say their HOA belongs in the Contact 13 Hall of Shame. Quintessa resident Jake Yamagata took the video below to show the water leaking from the walls. The leak began two months after an electrical fire in the bathroom area of Qunitessa II's clubhouse. The leak is coming from a pipe that used to be connected to a drinking fountain. Homeowners say it has been running like this non-stop since March. Jake reported the link to the HOA and kept a video diary documenting the waste. In one minute and 40 seconds, he filled a half-gallon container. That's about 2,500 plus gallons per week. "The second anything's out of order or out of array that you can see in the exterior of a house or in your yard, they'll send you a notice or they'll send you a fine. But when it's something they take care of then it's not as important." Quintessa finally did take care of the leak, having it capped off the day after Contact 13 called the board president. But that wasn't their only problem. A dead bird, mosquitos and green larvae were spotted in the swimming pool. 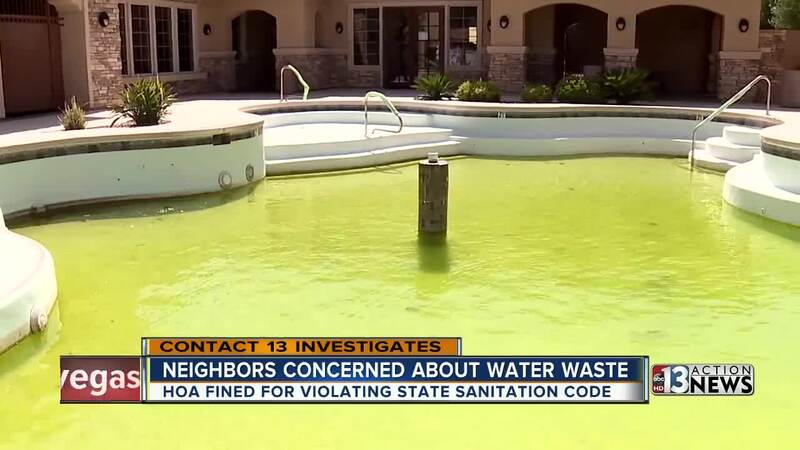 The Southern Nevada Health District fined the HOA for violating the state sanitation code. Instead of fixing the pool, the HOA drained it and it has been empty since May. Several weeks later, we returned after hearing from another homeowner. Rikki is a teacher and expressed her disappointment. "That is the one thing I look forward to every summer when school's out, get some laps, get a little color." Rikki Martin showed us the letter that was sent to homeowners from Quintessa's management company Camco. It apologized for taking so long to repair the pool and fitness center. The letter says the insurance claim check has been cut and should be received any day. That was on May 18. We had questions for Camco and paid them a visit. Christine Greengrass, Camco's Regional Director told us, "I agree and unfortunately from what I understand, there's been some delay on behalf of the board making decisions for opening this pool." Camco points the finger at Quintessa. Meanwhile, residents are caught in the middle. Watch the raw video from Darcy's visit to Camco below. Camco urges homeowners to come to the board of directors' meetings. Quintessa at Mountain's Edge is a shared-use community made up of two developments--townhomes and single family homes. It's governed by two boards--Quintessa I and Quintessa II. Both communities have access to the pool, gym and clubhouse--which are physically located in Quintessa II. The president of Quintessa II's board, Raymond Pelosi, would not comment on camera and referred us to their attorney, R. Duane Frizell. He would not comment on camera either but gave a statement over the phone. Frizell told us, "The Quintessa II board is well aware of the issues with the pool area. They are not the entity primarily responsible for remediation but are doing their due diligence." Each of the board members for Quintessa I, have been contacted, but none responded.